Since the crisis, Flint’s drinking water system has been one of the most closely monitored in the country. That's left us with a whole lot of data, which we compiled into one graph. 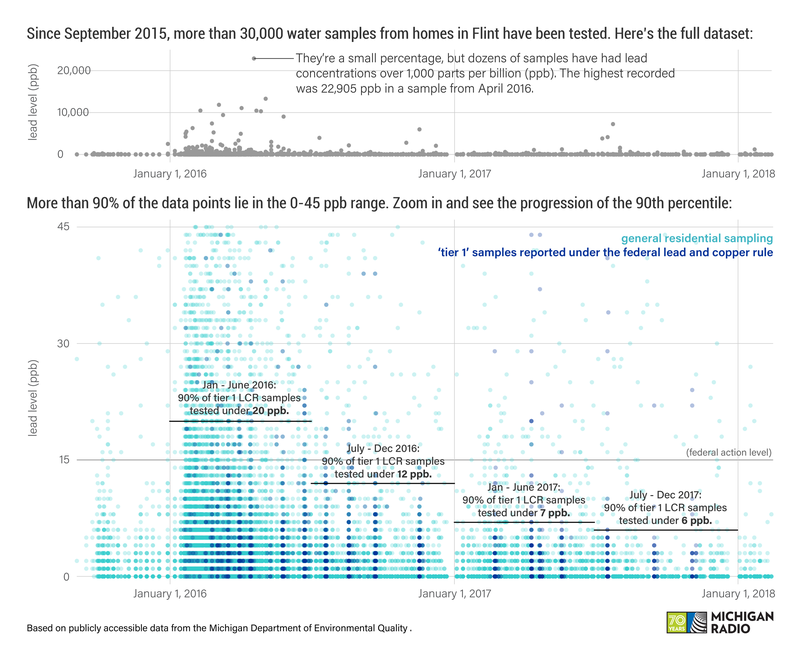 More than 30,000 water samples have been tested from homes in Flint since the water crisis made national news. Today, Flint's lead levels are well below federal action limits. Click image to enlarge. Most of the data comes from the first half of 2016, just after the crisis became national news. Testing has slowed down significantly since then, but it’s still going: more than 350 samples have been tested this year so far. When you remember that every data point represents somebody sending off a sample bottle of their water and waiting to hear back about whether or not it was safe, it really hammers home what the city went through. When you look at the full range of measurements (top panel of the graphic), it's hard not to notice the sheer ridiculous amount of lead in some of the samples. Dozens have measured more than 1,000 parts per billion (ppb) - the highest was almost 23,000, from a sample taken in April of 2016. Those numbers are outliers: less than one percent of all the samples collected, but they're still shocking. While there’s no safe level of lead, the federal standard is just 15 parts per billion. That said, most of the measurements (more than 90%) taken during this time period were less than 45 parts per billion, so the bottom panel of the graphic zooms in on that range to show more individual points and the overall progression of water quality. From a regulatory standpoint, the water quality of a city is defined by its 90th percentile; that’s the lead level that 90% of samples test below for a given time period. The samples used to calculate this number, called "Tier 1" samples, come from the highest risk homes. Things have definitely gotten better. For the first half of 2016, the 90th percentile was 20 ppb -- so it was above the federal standard. For the second half of 2017, it came in at six parts per billion. It’s been below the federal standard for 18 months now. So, when you hear the state saying Flint’s water quality has been “restored,” that’s what they mean. Listen to Stateside's interview with Michigan Radio reporter Steve Carmody. It has been nearly two years since the first indictments were handed down in the state's investigation into the Flint water crisis. 15 current and former state and city government officials were charged. Four of those cut plea deals. Ever since last fall, Special Counsel Todd Flood has been methodically laying out his case against the remaining eleven. Michigan Radio's Steve Carmody joined Stateside to give an update on where things stand. Officials with the company hired to oversee Flint's lead pipe replacement program met with city residents Thursday night. Last November, the city hired Los Angeles-based AECOM to oversee the project to replace thousands of lead service lines connecting homes to city water mains. The international engineering firm is being paid $5 million dollars. Thursday night, top executives delivered a broad outline of their plans.